Fragile. Compromised. Disappearing. 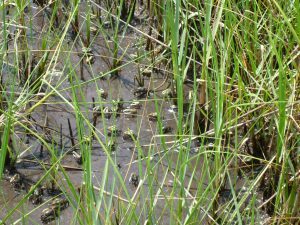 These words pop up frequently when describing the condition of Louisiana’s valuable wetlands. 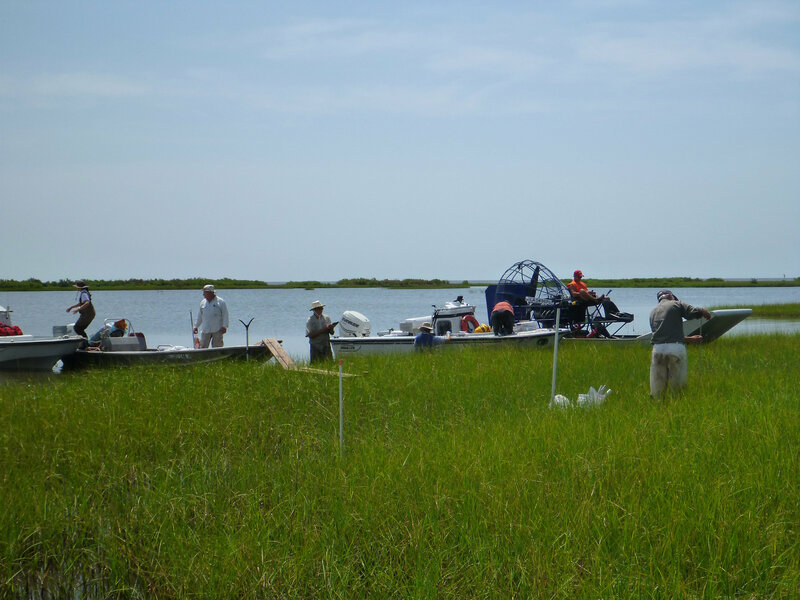 So how do researchers studying the effects of the Deepwater Horizon oil spill on coastal Louisiana collect the data they need? 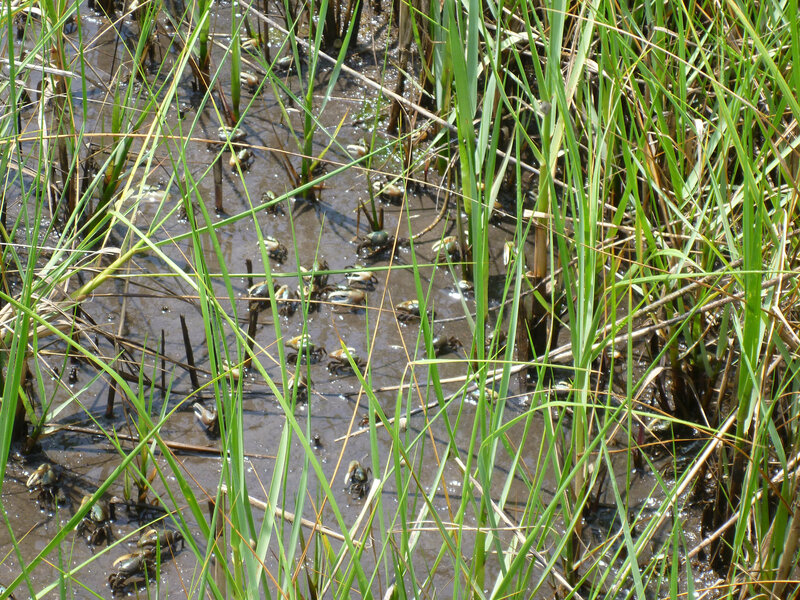 They do it very carefully, under the guidance of experts sensitive to avoiding additional harm to these marshes. 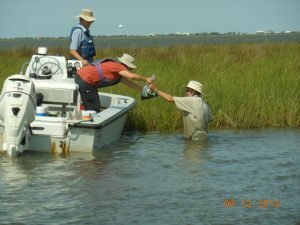 Funded by a Gulf of Mexico Research Initiative (GoMRI) award, the consortium “Effects of the Macondo Oil Spill on Coastal Ecosystems” directed by Dr. Nancy Rabalais at the Louisiana Universities Marine Consortium (LUMCON) is leading research teams in a thoughtful and coordinated effort to understand marsh ecosystems. 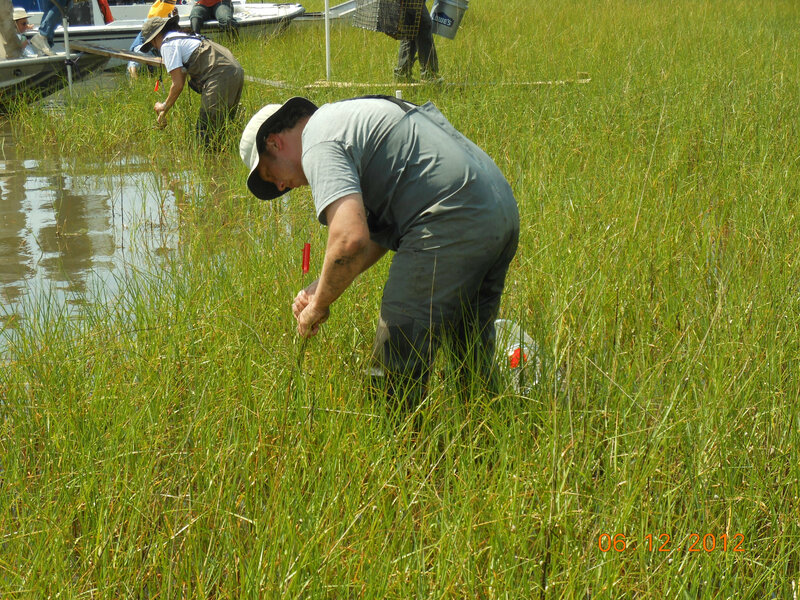 The consortium’s marsh studies are a continuation of work funded by a 2010 NSF RAPID grant. 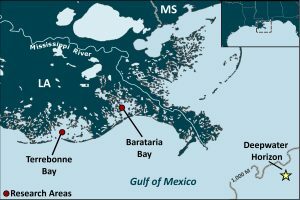 Researchers established basic characterization of 125 sites before the oil came ashore, conducted follow up at those sites after the initial oiling, and established paired oiled and unoiled sites for comparison studies. “Marsh Madness” – a collaborative effort among the consortium’s co-principal investigators – started in June 2012 and continued into July, with a large sampling effort of both oiled and non-oiled sites in Louisiana’s Terrebonne and Barataria Bays. Researchers used small boats and strategically-placed boardwalks to access study sites, critical elements in their experimental design to study long-term effects without destroying the experimental foundation. 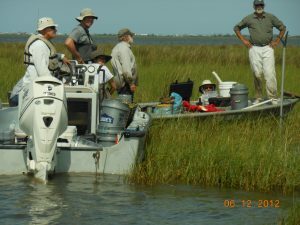 Researchers collect water and marine life samples to study microbial communities along the marsh edge searching for indicators of marsh health and responses to oiling. 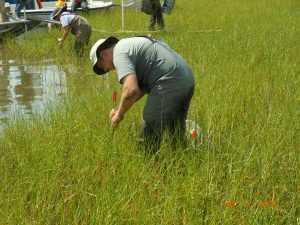 Observations and collections of insect and fish also provide researchers with data about the condition of marsh habitats. Scientists collect samples of marsh sediments to measure soil strength and sulfide concentrations. They are examining sediment nitrification potential and gas flux across the sediment-water interface. 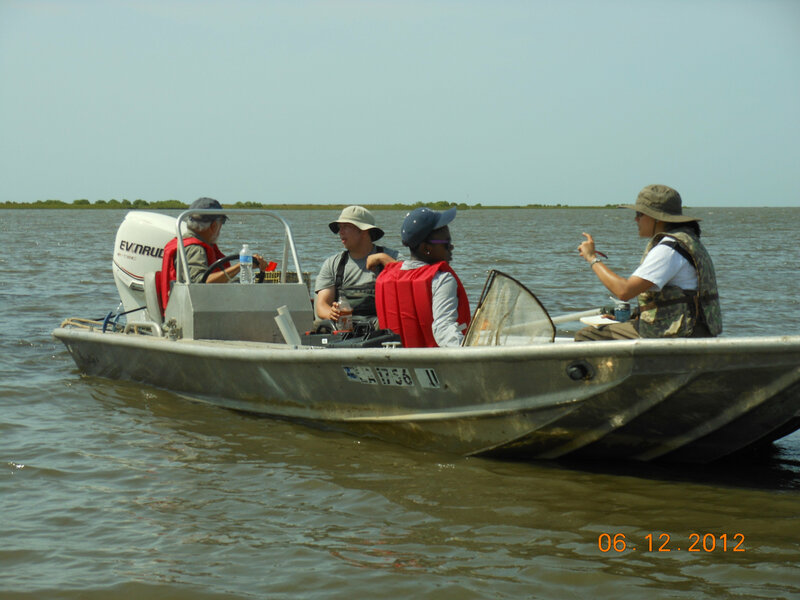 The researchers also collected interstitial water (subsurface water in the spaces between sediment particles) samples to analyze hydrocarbon composition and concentrations. 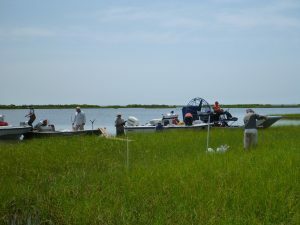 The scope of this research effort during June and July included projects led by scientists from LUMCON, Louisiana State University (LSU); the LSU AgCenter; Rutgers University; the University of North Carolina at Chapel Hill; the University of Tennessee; Connecticut College; and The Ecosystems Center, Marine Biological Laboratory at Woods Hole, MA. The consortium also actively involves students in oil-related research with the goal of developing a well-trained group of scientists that are equipped to continue these studies in the future. Two students funded by the NSF Research Experiences for Undergraduates and the GoMRI program are working with scientists in this summer’s collections and measurement activities. The GoMRI-funded consortium led by LUMCON is comprised of thirteen institutions – four from Louisiana and nine from other U.S. states. Their focus is the chemical evolution and biological degradation of oil and its environmental effects. 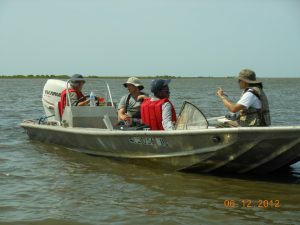 Their goal is to provide a benchmark study in ecosystem change analysis by identifying precursors to ecosystem trajectories before alternative states are realized and by addressing societal concerns about wetland stability and how the oil spill may have affected oxygen concentrations and planktonic and benthic communities in continental shelf waters. (Click to enlarge) Study areas for LUMCON’s marsh research.